Finally, good news for the auto industry. The NAIAS 2012 shows the Mercedes SL with a special display of its all-aluminum body structure. Does this mean Mercedes is stepping up as a leader in lightweight automobiles? It doesn’t matter whether Mercedes has used aluminum before or not. The fact the company is touting the lighter-weight structure at the NAIAS 2012 is sending an industry message: Mercedes is getting ready to lead the way toward lighter but safe structures for automobiles. If anyone can bring the convoluted process down to earth and for a reasonable cost toward high-volume production, my vote is on Mercedes to do it. German engineering has always been process oriented, but one that surrounds beauty with function. So, it is quite a history lesson to see an old SL next to the New SL. Yet, there is more to the outer differences that caught my eye this time. In fact, it was the aluminum body structure as a separate display. Of course, this is not my first day seeing an all-aluminum auto body structure. The Tesla Model S is a case in point. So is the Lotus line, and the Lotus-inspired Tesla Roadster. Point is, the electrification of the automobile and the efficiency of the automobile requires a change in paradigm, specifically lighter body designs; and now Mercedes is making a clear and intentional statement that it is in a position lead in this area with the SL. For the record, body design is not styling; whereas styling is industrial design and art combined. Body design, on the other hand, involves heavy engineering expertise. It must be light, it must enable all passengers to survive a crash; meaning, it has to absorb and dissipate crash energy. Present automotive manufacturing has, however, listened to the pandering of the steel industry and pinned its hopes on lighter steel offerings; meaning, stronger thinner sheets. However, the truth is the 54.5 MPG mandated for 2025 will require far more weight loss than steel can afford to give. Yes, whether you use electrification or ICE as a propulsion, aluminum will likely be the body structure of choice by 2025. In a rare private workshop following the week of The Battery Show 2011 last fall, Lotus Engineering brought together a small group of journalists to its Sterling Heights, Michigan office for a review of its technologies that will define the cars of the future. I was fortunate to be invited. Thus, Chapman’s philosophy was to engineer lighter racing vehicles rather than constantly just building larger, more powerful engines. Key to his many successes especially included vehicle handling, of which Lotus is still deemed the best in the world. If there is one area that Lotus excels it has to be in the area of lightweight body structures. The Lotus team believes that 40% lighter bodies are achievable, but the cost is deemed in America as too high, as aluminum (or aluminium as they say in England), is much more expensive that steel; plus the changes in manufacturing processes are vastly different than in present auto plants. However, Lotus believes emphatically that the industry still needs to view light-weight material costs amid all the savings that the rest of the systems will provide, because they do not need to be as powerful or in such large part counts. In fact, Lotus likes to tout the words that “the lightest component is the one that isn’t there.” So, design functionality is key. Thus, the Lotus team more often combines parts so as to attain multi-functions. In some cases, a part can handle 4-5 functions. The best descriptive words I heard was, getting rid of “all that parasitic mass, just sitting there.” As a designer with over 39 years, I dare say I had never heard it quite put that way before or thought of parts as parasites, but the gentleman from Lotus had a point. The Tesla S at the NAIAS 2011 had a full-body and chassis display showing the aluminum structure. This year, the body display was gone, but the chassis was there, showing aluminum floor and aluminum structural suspension parts. The achievements of the Tesla team is a great one, in my view. Problem is, the process does not avail itself readily to 60 units per hour, at least at the moment, which is a requirement for most automotive OEM factories. This by default also means carbon fiber body structures are even further behind the high-production capability curve. When I spoke with a Ford engineering manager about the limits of downsizing engines, he noted the next wave of gains for automotive will have to come in lighter body structures. No surprise there. After all, even I noted that Ford has already lowered the engine size to 1 liter. How much lower can it go? I then challenged him to think about the next evolutionary stage of engine developments, like HCCI and the Scuderi split-cycle air hybrid system. He then went kind of mum on me at that point. Again, no surprise; so did all the other experts at all the tech seminars that I attended in 2011. Now, either those technologies are in the lab getting ready for Job 1, or the OEMs are sitting on them because they were not developed in their own back yard but by outsiders. Nonetheless, regardless of the next wave of tech that will get us to 2025 mandated 54.5 MPG, lightweight body structures will have to be involved. There is no other option, unless the split-cycle efficiency somehow takes the engineering problems by storm; yet to be seen fully, but a possibility, in my opinion. 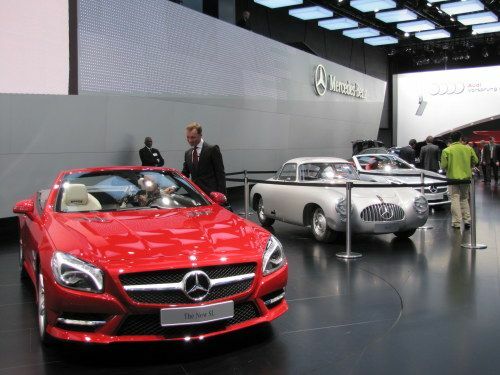 Nonetheless, I was pleasantly surprised to see Mercedes touting and displaying its aluminum structure for the SL model. Sure it’s a lower volume luxury car, but the Germans have the knack for bringing about the required changes in an industry that is today desperate for leadership in this area. We can only hope Mercedes will truly lead the way with lighter body structures, because Detroit automakers are still trying to play political MPG football by piecing and concocting their technologies in various combinations and minute stages like they have always done; rather than taking the bull by the horns, giving the public what it needs right now - right-sized, safe, affordable and efficient transportation for the masses. Question: Setting expensive full EVs aside, can anyone say 50 MPG in the city in a full-sized family sedan for a lease under $250 per month? I didn’t think so. Yet, that is precisely what the American public wants and needs. "I then challenged him to think about the next evolutionary stage of engine developments, like HCCI and the Scuderi split-cycle air hybrid system. He then went kind of mum on me at that point. Again, no surprise; so did all the other experts at all the tech seminars that I attended in 2011." As usual. Frank, your interviews are had hitting and revealing. You really cornered that guy on split cycle technology, didn't you? It seems like everybody you talk to about the Scuderi engine has no clue what you're talking about.